Greetings, fans and readers. I'm farmer Cameron's father. 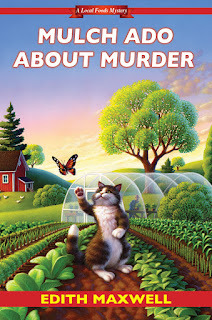 Ms. Maxwell says she has an advance copy of her new book to give away to one commenter by midnight Eastern Daylight Time on May 5, so be sure to stick with the post. Cameron's mother and I came to visit recently, and boy did we get into hot water. We're both anthropology professors, and since the semester was over and we hadn't left for our summer research abroad yet, we thought we'd stop by Attic Hill Farm and say hello to our girl. Even though we specialize in cultural death customs, we certainly didn't expect to have a murder right there in Westbury! It also didn't help matters that my dearly beloved wife had been arguing with the victim earlier in the day and had been publically protesting her new non-organic hydroponic business. But Deb would never murder anyone, so I felt obliged to help Cameron sort things out. Well, first I tried to help on her farm, but it turned out those plants I thought were weeds were really seeds she'd planted. Oops. So I decided to stick with the chickens. Fowl the world around and I get along just fine. Then we took in the Memorial Day parade, a small town spectacle in all its glory. Too bad it was disrupted by my wife becoming involved in yet another unexplained death. I must say, our normal university life is nowhere near as exciting! I was glad I could eventually help Cameron with some sleuthing, but our author says I'm not to tell you how it all came out. That's why you read the book. What's your experience with small-town parades? Ever decorated your riding lawnmower and joined the fun, or even your horse? Marched with a ball team or scouting troop? Or do you prefer to watch the Macy's parade from the comfort of your own home? Remember, one commenter gets an advance copy of the book - which comes out May 30! I used to ride on a float for our church in my hometown's 4th of July parade. I always loved going to the parade. mcastor07(at)Gmail(dot)com. Love your books! I take my Girl Scouts out to walk in a local Christmas parade every year. They love tossing candy to the crowd! We go for handmade candy canes and cocoa afterwards. Live in Phoenix and love to go to festival of lights parade in December!! I enjoyed watching small-town parades when I lived in various parts of North Carolina. My favorite part is the marching bands. Thanks for the chance to win.. salvatoresmom71 (at) yahoo (dot) com. I live in a small town of about five thousand people. We've had lawnmower races and our annual July 4th parade to name just a few fun things our town has for it's residents. I've never been involved in any floats but my daughter has worked on and ridden on our library float. Having grown up in a small town I loved the parades. All during high school I was in the band so in the parade. It was fun. I love hearing from Cam's father, and eagerly anticipate a new adventure. I've participated in anti-war and women's rights demonstrations, but mostly only watched parades from the sidelines. St. Louis had the Veiled Prophet Parade in the fall for many years, after dark, so the lighting made it very glamorous. The year I was born, my mother's doctor had her swallow castor oil to hurry me into the world so he could take his family to that parade. Later, it was moved to daytime and the July 4th weekend, and the V.P. name was finally dropped for Fair St. Louis. It has become a very large, so now I look for smaller celebrations. I walk in the St Patrick's Day Parade every year. Other parades I watch on TV. I've never been in a small town parade. I do enjoy watching them at home. 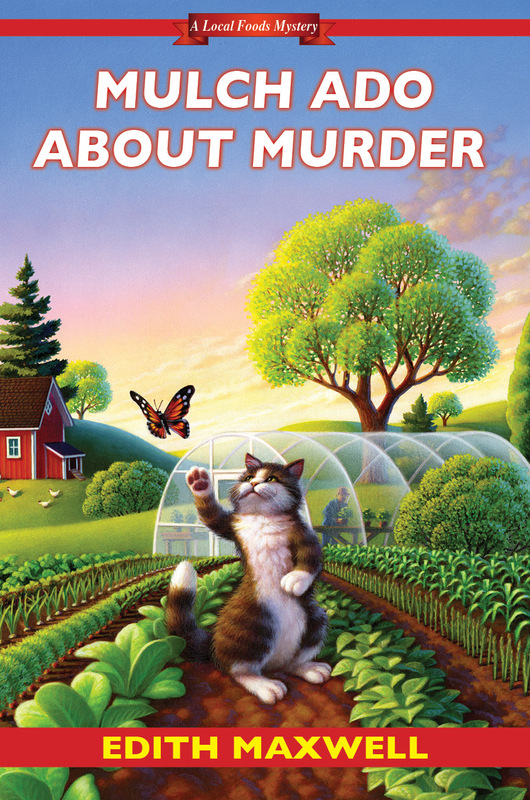 I love Edith Maxwell's books and would love to win a copy of Much Ado About Murder. I remember our home town Memorial Day parades because band members (in their beastly hot wool uniforms) would pass out and fall over! I attended the local St. Patrick's Day parade every year until I moved. My town doesn't really have parades. We have a lot of festivals. I watch the Macy's parade on tv every Thanksgiving. Thank you so much for the chance to win! As a kid/teenager I marched in a number of parades. As an adult I prefer to watch from the comfort of home. When I was in grade school I used to march in The Tulip Time Parade in Holland MI. It was five miles long, thankfully it's in the Spring. My dad and I rode our horses in the parade on the 4th when I was in grade school---what fun! Sue, you are the randomly selected winner! Congratulations. I sent you an email. Oh yes! As a kid, we could decorate our bikes. I remember weaving so much crepe paper thru the spokes! Thanks for the chance to win! I marched in our small town parade as a child. I was with the Girl Guides. I rode my horse in a parade in my town and rode on floats for the library. I've never been in a parade but it sounds like fun! I love Parades.When I was a child I used to be dazzled by the Majorettes...but the Christmas Parade was my favorite of all. I have worked on floats but never been in a Parade. Thanks for the chance..
My hometown was so small that we never had parades with floats but some other places that we did have especially in the town where we retired but I have never worked on decorating. In the only city we lived in, I volunteered in planning and fundraising but left all parade yjings to others due to my arthritis even as a much younger person. What a great article today and I am truly looking forward to reading your book, Edith. I once marched in a hometown parade as part of our Ladies' Kazoo Marching Band. I played two pot lids - I was the entire percussion section. I'm the leader of a group called American Heritage Girls and we march in a small-town Christmas parade and throw candy. Lots of fun! Congratulations! Nowadays,I am planning for building our small church on our land with the help of Effective church loan in USA. It's wait to have a rigt lender. I lived in a small town when I was very young and they had parades. We watched those sitting on the curb but, I never joined in. Now, I watch parades on TV..better viewing and far less crowded. Also, no climate problems.